Dame Gwyneth Jones, DBE (born 7 November 1936) is a Welsh operatic dramatic soprano. Jones was born in Pontnewynydd, Wales. Before becoming a professional singer, she worked as a secretary at the Pontypool foundry. She studied music at the Royal College of Music, London, the Accademia Musicale Chigiana (Siena) as well as the International Opera Studio (Zürich). After making her professional debut in 1962 as a mezzo-soprano in Gluck's opera Orfeo ed Euridice, she was engaged by the Zurich Opera House. She discovered that her easy top range could enable her to sing soprano roles and she switched to the soprano repertoire from around 1964, her first major soprano role being Amelia in Verdi's Un ballo in maschera. Jones came to prominence in 1964 when she stood in for Leontyne Price as Leonora in Verdi's Il trovatore at the Royal Opera House, Covent Garden. Her career then developed rapidly, and she met with success as Aïda, Leonore (in Fidelio), Desdemona (in Otello), Elisabeth (in Don Carlos), Donna Anna (in Don Giovanni), Cio-cio-san (in Madama Butterfly), Lady Macbeth (in Verdi's Macbeth), Santuzza (in Cavalleria rusticana), Octavian (in Der Rosenkavalier), Médée (in the Italian version) and Tosca. From these, she gradually proceeded to heavier roles like Chrysothemis (in Elektra), Salome, the Marschallin (in Der Rosenkavalier), Eva (in Die Meistersinger von Nürnberg), Senta (in Der fliegende Holländer), Kundry (in Parsifal), both Venus and Elisabeth (in Tannhäuser), Helena (in Strauss's Die ägyptische Helena), Ariadne (in Ariadne auf Naxos) and Sieglinde, as well as Brünnhilde (in Die Walküre). She has appeared frequently at almost every major opera house in the world, including the Vienna State Opera, the Zurich Opera, the Royal Opera House, Covent Garden, the Bayerische Staatsoper, the San Francisco Opera, the Deutsche Oper Berlin, the Paris Opéra, the Teatro alla Scala, the Los Angeles Opera, the Metropolitan Opera, the Gran Teatre del Liceu, the Grand Théâtre de Genève, the Lyric Opera of Chicago, as well as many prominent opera and music festivals. 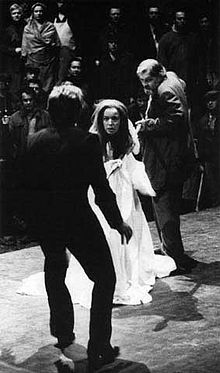 She made her debut at Teatro alla Scala as Leonora in Il Trovatore on 4 April 1967. She returned to La Scala as the title role of Salome in January 1974. On 24 November 1972, she made her debut at the Metropolitan Opera House of New York as Sieglinde in Die Walküre. Until her last appearance at the Met on 22 April 1995 (as Kundry in Parsifal), she sang 11 parts in 10 operas for 93 times at the Met; the most frequent part was the Marschallin in Der Rosenkavalier (20 times). In August 1979 she made her debut at Salzburg Summer Festival as the Marschallin. Jones's large-scaled, powerful dramatic soprano voice, unusually robust vocal stamina, stage presence and acting abilities were widely admired. One of her most noted[by whom?] achievements was her interpretation of Brünnhilde in the Bayreuth Jahrhundertring (Centenary Ring) in 1976, celebrating the centenary of both the festival and the first performance of the complete cycle, conducted by Pierre Boulez and staged by Patrice Chéreau. It was recorded and filmed in 1979 and 1980 for both video and audio discs. The recording won a Grammy in 1983. Later in her career (from 1980 onwards), she undertook the title role of Elektra as well as Isolde (in Tristan und Isolde), the Dyer's Wife (in Die Frau ohne Schatten), Turandot and Minnie (in La fanciulla del West). While best known for her work in the Wagner-Strauss-Puccini repertoire, her versatility enabled her to take on other roles, such as Poppea (in L'incoronazione di Poppea), Hanna Glawari (in The Merry Widow) and Norma. Starting from the 1990s, other than the aforementioned parts, she went on to sing Widow Begbick (Mahagonny), Ortrud (in Lohengrin), the Woman in Arnold Schoenberg's Erwartung, the Kostelnicka (in Jenůfa), the Kabanicha (in Káťa Kabanová), the Woman in Poulenc's La voix humaine, Ruth (in The Pirates of Penzance), Gertrud (in Hänsel und Gretel), Herodias (in Salome) and Klytemnästra (in Elektra). She appeared as the Dyers Wife in Die Frau ohne Schatten at the Cologne Opera in 1980 in a production by Jean Pierre Ponnelle, conducted by John Pritchard, with Walter Berry as the Dyer, Róbert Ilosfalvy as the Emperor, Siv Wennberg as the Empress, and Helga Dernesch as the Amme. Jones made roles that exemplify the Wagnerian/heavy dramatic soprano fach, such as Brünnhilde, Isolde, Elektra, the Dyer's Wife and Turandot, part of her core repertoire, and performed them throughout the 1980s and 1990s. She once famously undertook the roles of both Elisabeth and Venus in Götz Friedrich's production of Tannhäuser at the Bayreuth Festival in the 1970s, and has also been credited with the rare achievement of having performed all three major female roles in Elektra on stage. She also performed in concerts and lieder recitals, television and radio broadcasts and participated in several film projects, including the epic television series, Wagner, in which she played the first Isolde, Malvina Schnorr von Carolsfeld. She has also devised for herself a couple of one-woman music-theatrical shows – O, Malvina! and Die Frau im Schatten – which are inspired by real historical characters, namely, Malvina Schnorr von Carolsfeld and Pauline de Ahna (wife of Richard Strauss). The soprano part in the Symphony No. 9, titled "Vision of Eternity", of Welsh composer Alun Hoddinott was written for, and premiered by, her. In 2003 Jones made her debut as director and costume designer in a stage production of Der fliegende Holländer in Weimar, Germany. She has also given master-classes for young singers and acted as an adjudicator in international vocal competitions, including the 2009 BBC Cardiff Singer of the World competition and, more recently, the 2017 season of the reality operatic singing competition on the Russia-Kultura TV Channel, "The Big Opera" (the whole series of competition now being available for viewing on YouTube). Despite her advancing years and the extraordinary demands of her chosen repertoire, she remains an active performer on the stage, taking on various soprano, mezzo-soprano and even contralto roles with vocal authority and dramatic conviction. In June 2007, she created the role of the Queen of Hearts in the world premiere of Unsuk Chin's new opera, Alice in Wonderland, at the Bavarian State Opera. In February 2008 she sang the part of Herodias in Stephen Langridge's production of Richard Strauss' Salome at Malmö Opera in Sweden. She repeated this role in August 2010, alongside the Salome of Deborah Voigt, in a concert performance at the Verbier Festival in Verbier, Switzerland, and performed the part on stage at the Vienna State Opera in May 2012. Jones also took part in a piece of musical theatre about the women of the Wagner clan and their influences on the Bayreuth Festival entitled Wagnerin. Ein Haus der Kunstmusik, directed by Sven Holm at the 2012 Munich Opera Festival. In it, she portrayed the part of Cosima Wagner. In March 2016, at the age of 79, Jones made her role debut as the Countess in Tchaikovsky's The Queen of Spades in a new production of the opera at the Staatstheater Braunschweig, Germany. In April, 2017, she took on the part of the Narrator in Richard Strauss' Enoch Arden in a concert in Landsberg. Jones makes a guest appearance in Quartet, a film by Dustin Hoffman, based on the comedy by Ronald Harwood about several retired opera singers planning to put on a concert to celebrate Verdi's birthday. She takes on the role of Anne Langley, a former operatic rival to Jean Horton, played by Maggie Smith. The film was premiered to largely favourable reviews on 9 September at the 2012 Toronto International Film Festival, and Jones's performance was critically acclaimed. She was made Commander of the Order of the British Empire (CBE) in 1976 and was promoted to Dame Commander of the Order of the British Empire (DBE) in 1986. She is also the recipient of numerous musical/cultural awards and honours from many different countries and organisations, including the Verdienstkreuz 1. Klasse of the Federal Republic of Germany, the Golden Medal of Honour in Vienna, the Austrian Cross of Honour First Class, the Shakespeare Prize and the Puccini Award. She is a Kammersängerin at both the Vienna State Opera and the Bavarian State Opera and she has been made a Commandeur de L'Ordre des Arts et des Lettres in France. She has also been conferred honorary doctorates by the University of Wales and the University of Glamorgan. She is currently the President of the Wagner Society of Great Britain. Gwyneth Jones: Verdi Arias: Arias from Aïda, Don Carlo, Macbeth, Otello. Orchestra of the Royal Opera House, Covent Garden/Edward Downes. Decca 1969. Gwyneth Jones sings Strauss Lieder: Includes Zueignung, Die Nacht, Allerseelen, Cäcilie, etc. Geoffrey Parsons, pno. Capriccio 1989. Gwyneth Jones sings Strauss: Vier letzte Lieder, etc. Tokyo Symphony Orchestra/Roberto Paternostro. KOCH Schwann 1991. Gwyneth Jones sings Wagner: Scenes from Tannhäuser, Lohengrin, Tristan und Isolde, Götterdämmerung. Kölner Rundfunk-Sinfonie-Orchester/Roberto Paternostro. Chandos 1991. ^ Die Frau ohne Schatten (in German). Cologne Opera. 16 March 1980. Wikimedia Commons has media related to Gwyneth Jones (soprano).